There's nothing I love more than exploring new cities. Choosing a city, doing a ton of research, sight-seeing, going for runs along new streets and paths, eating all the food - there is really nothing better. Austin was the first time I really got to pick a place and embrace it - seeing a ton of things, running a race, and exploring many different parts. When I visit new cities on work trips, I typically only see the area my hotel is in when it's really early in the morning and really late at night. I try to get in a run because it's the best way to get a feel for a city, and luckily, there is always time for a few amazing meals out. After Nashville I had a few weeks home in New York City before heading to Minneapolis, Minnesota. I was dreading it, to be completely honest. I was under the impression it would be unbearably cold and I would be miserable. But Mother Nature treated us to temperatures in the mid to high 30's meaning I didn't cry every time I stepped outside. This made adventures to restaurants and even a night-time run much more do-able. If you have a trip to one of the twin cities coming up - here's the food I checked out while in town. A signature Minnesota meal is the "Hot Dish" - a casserole of potatoes, pasta, ground beef, green beans, corn, canned soup, tator tots, etc. etc. That's where the whole "Haute Dish" name comes from. But that's not why I went to Haute Dish. I went to try their vegetarian 4-Course Dinner menu! It's only offered on Mondays (Meatless Mondays), which is when I arrived. Perfect! The place was pretty empty when I got there, and smelled strongly of cleaning products. I sat down at the bar and a friendly bartender presented me with the menus. I told her right away that I wanted to do the vegetarian menu and anxiously awaited my first course. *Please excuse the truly horrid food photography - it seems that no restaurant in Minneapolis has proper lighting for my Instagram needs. This play on a BLT swapped bacon for mushrooms - of the crimini variety. The use of iceberg lettuce irked me a little bit (I'm a greens-snob I suppose) but the choice of honey mustard, though somewhat strange, made me smile. After all, honey mustard is the best condiment. I'm pretty sure that Haute Dish used Ken's Honey Mustard dressing (though they claimed it was a "Walnut Honey Mustard") which was delicious slathered on some lettuce, mushrooms and tomatoes. This wasn't very creative and didn't thrill me - but luckily the best was yet to come. Lemon vinaigrette, pine nuts and shoestring potatoes. Typically, I LOVE beets. But with this dish, they seemed to be overly earthy tasting. The cubed beets were paired with sweet potatoes, which I happily ate and the lemon vinaigrette added a nice springy sweetness to the otherwise wintry dish. Some people may think this dish had too much going on - but I am not one of those people. When I saw that braised fennel was one of the dishes, I was super dissapointed. Truffles and Fennel are two flavors that I just cannot get behind. Every time I eat fennel, it reminds me of licorice. Blech. But THIS DISH. I completely cleaned my plate and wanted more more more. The beans, the pureed apricot, the fruit compote, the salty and crispy fried leeks...ah, what a winner. Though the first two courses weren't all that exciting - this one more than made up for it. Ready for this - quite possibly the first (and last) time I skipped the dessert - even though it was INCLUDED. I know, I know. I had a shockingly long list of restaurants I was dying to try while in Minnesota. Sadly, I couldn't possibly fit them all in. But after going back and forth between Borough and 4 Bells on Tuesday night - I am so so happy we found ourselves in Borough's open, rustic-chic dining room. The wait staff was wonderful. They gave us a ton of recommendations and when each dish came, they gave a thorough overview. And each dish was plated beautifully - everyone knows you eat with your eyes first! And this time, I wasn't the only one who wanted to snap a picture of the chow. While the entrees sounded good, the three of us were more interested in the many amazing small plates and decided we would just split a whole lotta stuff. This was definitely the right call. *Sadly, the soup was not photographed. Soup may not be the first dish you think of when you're going to be splitting among a group - and we questioned the decision at first - but we just couldn't resist the sound of this perfectly wintry soup. It had everything - sweet, savory, salty, earthy. And to let us eat with our eyes first - the soup was poured table-side. A plate was brought out with the prosciutto, farro, grapes and the butternut squash, turnip soup was poured over it at the table. I'm a big fan of the table-side soup service...it makes an underrated dish more exciting. Sounds a little strange, right? Yet when we dug in, we realized "THIS WORKS." It really, really works. I am a huge turnip fan, and to see it featured so many times on this menu made me happy that it was having it's moment, at least in Minneapolis. This salad may have been one of my favorite parts of the meal - though I'm at a loss for descriptive words now. After a ton of research, I'm still unsure if those spiky green things on top of this dish are the juniper - but whatever it was - it made the dish. This unique herb added such a unique flavor to the otherwise standard pork & brussels sprouts dish. I'm sure restaurateurs never expected brussels sprouts to become so popular. Just goes to show you that everything is better paired with bacon. Oh wow. I've eaten my fair share of octopus - including octopus on Greek Islands - but this was simply STELLAR. 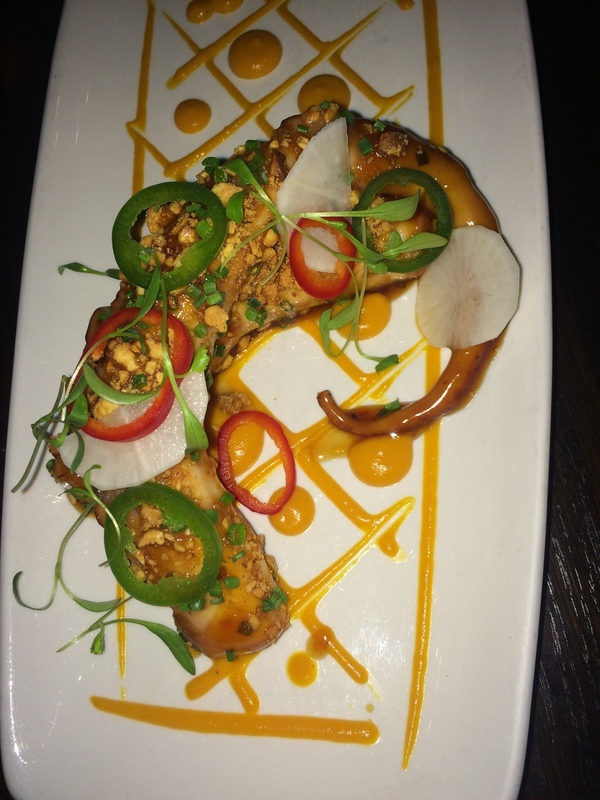 Not only were the surrounded elements and flavors incredibly well put together, but the octopus was just SO TENDER. It's very common for octopus to be chewy and tough, but not at Borough. Education time! If you're like me, you have no idea what chermoula is. Let's change that. According to Wikipedia, Chermoula is a marinade used in Algerian, Libyan, Moroccan and Tunisian cooking. The main two ingredients are usually garlic and coriander with some varying mixture of herbs, oil, lemon juice, pickled lemons, cumin, salt, onion, chili peppers, black pepper and saffron. Unfortunately, the samosas were the one dish that didn't "Wow" us, though there was nothing "bad" about them. I was more of a fan of the lentil, dried fruit and cashew salad that the samosas sat atop. This was the one "entree" portioned plate that we chose. Again, the dish was full of complex and interesting flavors and overall, delicious. The salmon was slightly dry and the dehydrated shrimp was an odd addition, but that coconut broth over black rice - lordy. I wanted to bathe in it. We couldn't decide if we were ready to make the leap into dessert territory quite so early into the trip - but after the waiter came over and raved about the dessert chef's "chocolate" creation we could not resist. There was not one thing about this dessert that wasn't incredible. BANANA CREME FRAICHE FLAVORED ICE CREAM. Please, give me an IV of it. If you're in the Twin Cities and you can only grab one meal - MAKE THIS IT. This is not the type of place I intended on visiting - I was aiming to stick with healthy(ish), farm to table restaurants with a focus on vegetables and fresh ingredients. But then I overhead a conversation about Hell's Kitchen, a few blocks from our hotel, and the words, "homemade banana peanut butter." My fate was sealed. I simply needed to go. A few Google and Yelp searched quickly revealed that it wasn't just the homemade PB that I needed to try - but three very distinct dishes that they have come to be known for. I was up for the challenge. I sat at the bar, alone, and ordered 3 entrees. No shame in my game. Yes, you read that right. I was super grossed out at first - and really upset when I realized THIS is what they serve their homemade peanut butter with. I had a feeling this might not be my favorite thing in the world. Though I love sausage - I just wasn't sure about "deliciously dense bread made with sausage, toasted walnuts, black currants, spices and black coffee." I'm glad I tried it, because it was certainly unique. It wasn't that I hated it, but it definitely wasn't my cup of tea. And I could only stand a few bites before I pushed it to the side in favor of some regular old toast to dunk in the homemade banana peanut butter. The PB wasn't all I had hope to be, unfortunately, and it left me wondering if it had been a mistake to dine here. The lemon ricotta pancakes were a major upgrade from the sausage bread. They had a lovely hint of lemon paired with the savory richness of the ricotta. I'd never had ricotta pancakes before, and you could really tell it was in there! None of this food was pretty - especially this strange concoction of wild rice simmer with heavy cream, roasted hazelnuts, dried blueberries, sweetened cranberries and pure maple syrup. This was pretty delicious - for a few bites - but overall it was extremely heavy and I couldn't even come close to finishing the cup (though that could have had to do with the fact that I had 2 other dishes to work on). My issue with Hell's Kitchen was that everything was greasy, heavy, and a little strange. That being said, it was definitely a unique Minnesota experience. On the weekends, they have DIY Bloody Mary Bar and they also have live music every night! This place was right around the corner from our hotel, and though it wasn't on my "list of places," I was pleasantly surprised by the meal. There are no pictures, because I was with people from a generation who would be slightly baffled if I insisted on taking pictures of their plates. Always a light, satisfying appetizers for the table. They came served with a cilantro-yuzu aioli that was addictive. I think this salad was created with me in mind. Okay, it definitely wasn't, but it had GRAPEFRUIT and ARUGULA! Plus, goat cheese, balsamic, beets and EVOO. Heaven, I tell ya. I can't say no when I see PESTO. This was cooked perrrrfectly. The Sea bass fell apart in beautiful sheets of tender, juicy, fishy joy. The tai chili beurre blanc wasn't overpowering, and the mashed potatoes were moist and flavorful. There are some nights where the last thing I want to do is go out for a sit-down dinner. That's when I use the Postmates app to explore delivery options in the area - they'll deliver it straight to my hotel room door and there are endless possibilities, unlike the over-priced room service menus. I stumbled upon Agra Culture Kitchen and ordered a healthy dinner. I wasn't super impressed, but then again, it was delivery. It was fine all things considered. I'm such a sucker for arugula. And avocado. And fruit in my salad. What we have all clearly learned from this post is that Lauren loves Pesto and Arugula. This was simple and healthy which is what I was looking for. If you've been here at Peanut Butter Is My Boyfriend for awhile, you'll know that donuts are kind of my thing when I travel. Some people collect key chains or magnets when they visit a new place, but I find the craziest donut place and go nuts. A friend's birthday was the perfect excuse to pick out half a dozen donuts to taste test at breakfast one morning. The donuts at Glam Doll are the creation of Teresa Fox - there are lots of interesting flavors and everything is made 100% from scratch. They offer raised donuts (what we here in NY call "yeast donuts), filled donuts, cake donuts, crullers, fritters and even a large selection of vegan donuts! I had the donuts delivered via Postmates, and some substitutions were made to my initial order, so I can't say for sure each donut that we tried. But rest assured, I tried all 6 that we received. It's really no surprise that the Varga Girl was my favorite - filled donuts are always my jam, and the almond filling in this bad boy was to die for. I missed trying a cake donut, but I'd say our sampling was on point. But I was shocked that as we made the way around the breakfast room offering donut nibbles to people - EVERYONE WANTED THE PLAIN GLAZED DONUT. Live a little, people. I was also weirdly surprised at how much I enjoyed the lemon cruller - fruity vs. chocolatey donuts might be a new realm to explore. Steakhouses aren't usually my first choice - but I have been quite a few phenomenal steakhouses. In these cases, I can appreciate the food, the experience, and the gluttony of receiving a plate of mashed potatoes the size of my face. Unfortunately, Manny's just wasn't that great. Everything was over-the-top large which was more a gimmick than an indication of quality. The asparagus we ordered for the table was so incredibly thick that it was inedible. Surely, the chef knows that when it comes to asparagus, the slimmer the better! The mashed potatoes had some shredded cheese melted over them - making them seem extremely unsophisticated. The salads were fine, and I will give credit where credit is due - the Maine Lobster Cakes that I insisted on ordering for the table were full of TONS of lobster meat. My entree, the filet mignon, was tasty but not anything out of this world. But one thing I can get behind enormous portions of is DESSERT. And the slice of cake delivered to our table was large enough for myself and 3 large men. It was a chocolate Bailey's cake and it was one of the most decadent desserts I've ever eaten - and trust me, I've eaten a LOT of desserts. When it was time to leave Minneapolis, I had been indulging for 8 days and nothing sounded better than a great big smoothie bowl to the face. Their Acai Bowl featured a blend of acai, bananas, cranberries, hemp seeds and orange juice topped with banana, granola, coconut flakes and chia seed pudding.